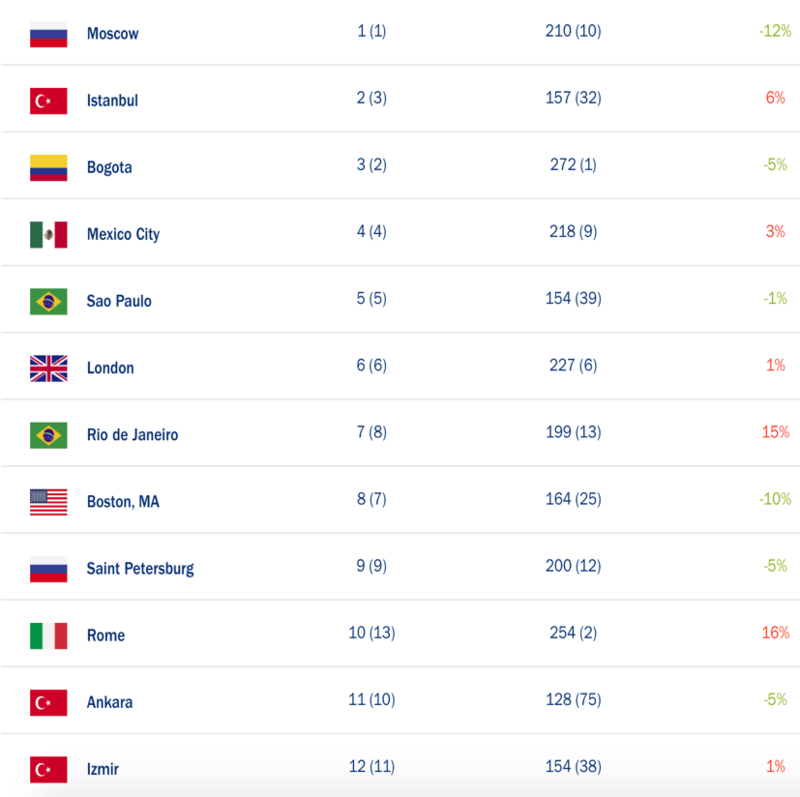 The traffic data company INRIX has published its annual Global Traffic Scorecard that identified and ranked congestion and mobility trends in more than 200 cities across 38 countries, saying Moscow is again the world’s worst for traffic jams. It says the Russian capital suffers 210 hours lost due to congestion and when weighting for population is the worst in the world, followed by Istanbul, Bogota, Mexico City and São Paulo. However Londoners suffer 227 hours per year, while Bogota ranks worst for unweighted hours at 272 per driver per year. Other South American cities suffering bad congestion are Mexico City and Sao Paulo. INRIX says the dominance of Latin American cities should not be a surprise due to their rapid urbanisation, high levels of informal settlements, unforgiving topographies and financial volatility. In the UK, drivers lost an average of 178 hours a year due to congestion, costing drivers U.K. drivers nearly £8 billionin 2018, an average of £1,317 per driver. London (227 hours lost due to congestion) and Birmingham (134 hours) ranked as the two most congested cities in the UK by the INRIX overall impact of congestion ranking.